I've already posted about Ruffwear's "Grip Trex" Boots - my first review was in regards to the snow, and a "light" hiking trip and a snow shoeing trip, you can see that review HERE. This review is different, we hiked the South Sister located in Oregon. This hike is rated as "Extremely Difficult". For our South Sister adventure please click HERE. Didn't need the boots yet. I am proud to say the boots did great!! Hiking the South Sister your dog really should have boots on, they may not like it at first but sometimes we all have to do things we don't like. When you first introduce the boots keep it a positive experience. Take your dog out and do something fun, use distractions, don't let them focus on the boots, and bring lots of treats. After a while of practicing regularly your dog will associate the boots with fun stuff! For most of our hike Dante did not need the boots, but as we got closer to the mountain the trail became more rocky - especially nearing the beginning of the ascent to the False Summit. I checked his feet regularly during our hike, about a mile to the False Summit he began to walk a bit funny, the rocks were obviously uncomfortable. Keep in mind we also aren't walking on your average dirt - this dirt/dust consists of dust from pumice stones and just walking on it wears down the pads on your dogs feet. So on went the toddler socks and boots! He immediately was walking better. Another important thing to note is that the boots really helped with traction, as we navigated the trail and walked through larger sized sharp rocks. After reaching the False Summit the trail turns into lava rocks the rest of the way to the top. At certain points of the trail the rocks were so loose that our feet sunk down into the gravel. Good thing he had on those boots! 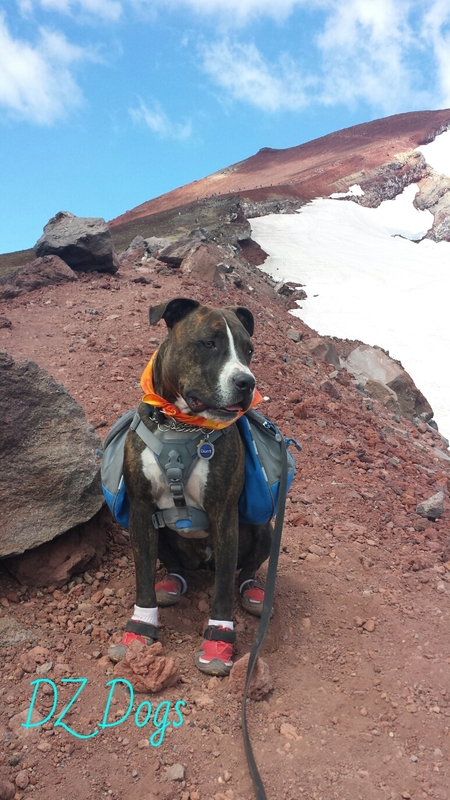 While the socks helped to keep dirt/dust out, the shoes gave Dante traction and kept his paws from being sliced to ribbons on the sharp lava rocks. The boots were very important here! 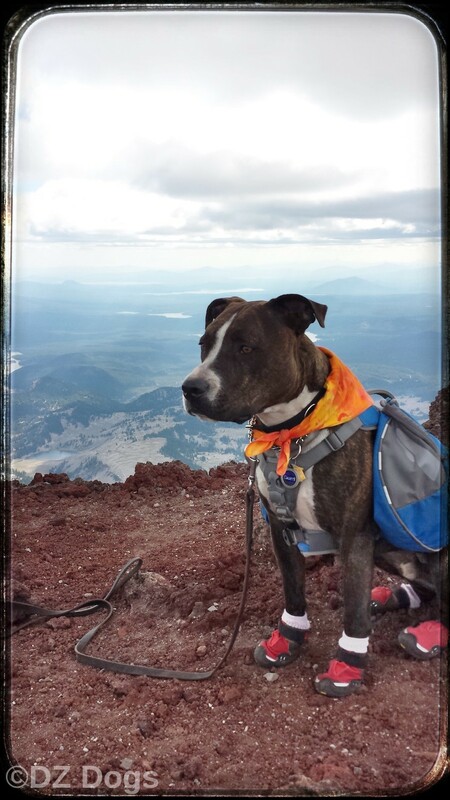 I'm thankful to say Dante made it to the Summit of the South Sister without damaging his paws! Total he wore the boots for about 6 miles, 3 miles to the top, and 3 miles back down. The hike back to the car he didn't need them because the terrain changes the further away you get from the mountain. The whole trip I was checking his feet for injuries, and a big thanks goes out to Ruffwear! 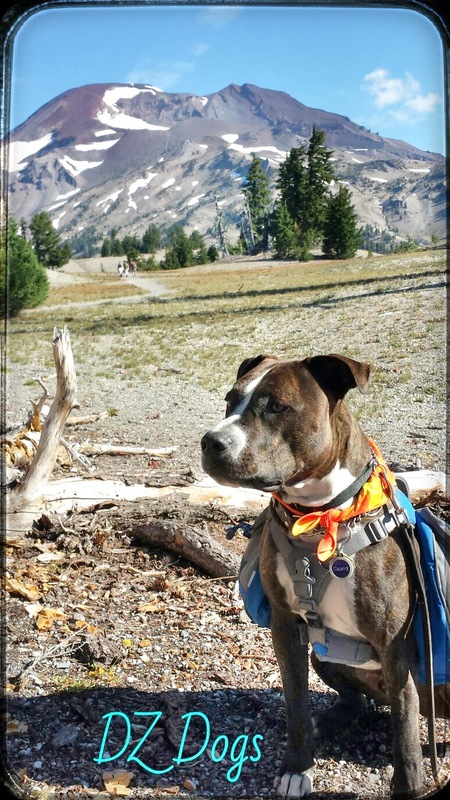 He only had 2 injuries for the trip, his backpack cut him under his arm (not a Ruffwear product), and during a incident where we slid down part of the trail he bruised a toe. No blisters or rubbed spots thanks to the socks! The boots stayed on great, and were easy to shake out after we finished the hike. I then ran them through the wash and they came out looking like new again. We loved the boots! Once again they pulled through and saved the day! Wear your boots or stay home! We saw many dogs on the trail without boots and felt sorry for them, one owner was even carrying his pup because her feet had already been hurt from not wearing boots. Provided Great Traction thanks to Vibram made out-soles. We'd like to recommend these boots for any dog owners who have active outdoor dogs. This is not a paid promotional post - we purchased these boots on our own and just wanted to share our opinion of them with you! I really like the idea about having socks with the boots! I wouldn't have thought about that. South Sister looks like a pretty epic hike, good job both of you on completing it with only minor injuries. Loved your review! I just used these for the first time on Rama last weekend for our review, but they wouldn't stay on. :-/ I think I need a bigger size, even though I followed their measuring guidelines. I'm going to pass them down to Cairo and get Rama a bigger pair. Love your photos! What an awesome place to hike! I think I looked at them but they don't come in Mr. N's size! We rarely go hiking where he would need boots though but that trail looks like you definitely would. I've noticed Jack getting a little sensitive to rougher terrain, I'll have to try this for him maybe. We have seen these boots at the store and they look really nice and sturdy. We don't have anywhere to hike where we would need them. In the winter we sometimes wear something on our paws because of the extreme cold -20F or so, but we are only out for about 15-20 mins in those temps. We will keep these in mind if we do need some good boots. Thanks for joining FitDog Friday! Those boots look great and I love your tips for getting dogs to wear them. I wonder how they'd work with furry paws like Rocco has. We may need to check them out. A proper, well constructed dog boot needs to protect the dog's feet from the elements and allow for the dog's foot to move properly. Dog booties should not look, or act like people shoes. There is a big market for dog gear that appeals to humans, and is useless, or dangerous to dogs. We don't need booties for the heat or jagged terrain here, but we do use them when it is cold out! I always have booties on hand, and a spare for every dog I run in the cold. But I look for a bootie which is made with dogs in mind. I would say that Ruffwears' Dog Boots do not act like human boots. Their toes have plenty of space to move around, and their is no constriction of movement. When we practiced we took Dante out to play in our field, and he ran around like normal. Proper sizing is key and they have an easy sizing chart right on the box for your pup to step on to determine the size of their paw while spread. These boots while not so great for snow, are perfect for hot surfaces and jagged terrain that would damage a dog's paw. The vibram bottom is flexible and strong and was perfect for walking on lava rocks that would otherwise rip up a softer soled boot.